The iPhone will be celebrating its tenth anniversary this year, and Apple is doing everything to make it memorable for its fans. The iPhone 8 is expected to sport some significant changes, and a hoard of leaks corroborates that effort. Fresh reports bring more information on all the features that are going to be included in the iPhone 8 including enhanced HDR and MultiBiometrics support. Furthermore, photos of the iPhone 8, iPhone 7s, and iPhone 7s Plus have emerged as well giving us a better idea about their designs. First up, the HomePod code leak has been a gold mine for tipsters, and developer Guilherme Rambo has leaked fresh information about iPhone 8 features. In the code, he found that the iPhone 8 will automatically silence notifications if it finds that the user is staring at the screen, courtesy the facial unlocking sensor at the front. This is quite intelligent as you don’t need notifications to ring when you are using the device. The code suggests support for multi-biometric options. The code also pointstowards a camera capable of recording 240 frames per second on video at 1080p resolution -a significant increase in quality if true. To recall, the code had earlier tipped 4K video recording at 60fps, and both can certainly come to pass. The iPhone 7 is capable of 720p resolution only. There are also hints of enhanced HDR referred to as ModernHDR in the code. A new video, courtesy YouTuber Danny Winget, has been published comparing dummy units of the iPhone 7s Plus and iPhone 8. The iPhone 7s Plus is seen with the traditional horizontal camera setup, the rumoured glass back that enables wireless charging support, and the display remains unchanged from the predecessor, with the home button still intact. The iPhone 8 is much shorter and wider than the Plus variant, and it also features a glass back, with a vertical dual camera setup instead. However, the big difference is in the front with no home button, hardly any bezels, and a lot of sensors on top. The iPhone 8 is rumoured to ditch Touch ID altogether, and introduce Face ID as a form of exclusive authentication. The iPhone 7s Plus is going to prove to be a good alternative for those who do not want to let go of Touch ID. Tipster Benjamin Geskin has shared dummy units of the iPhone 8 in Copper, Silver, and Black, and a cleaner render of the iPhone 8 in Copper Gold. He has also shared a hands-on video of the Black variant, and all of them corroborate the same design information as Winget’s leak. 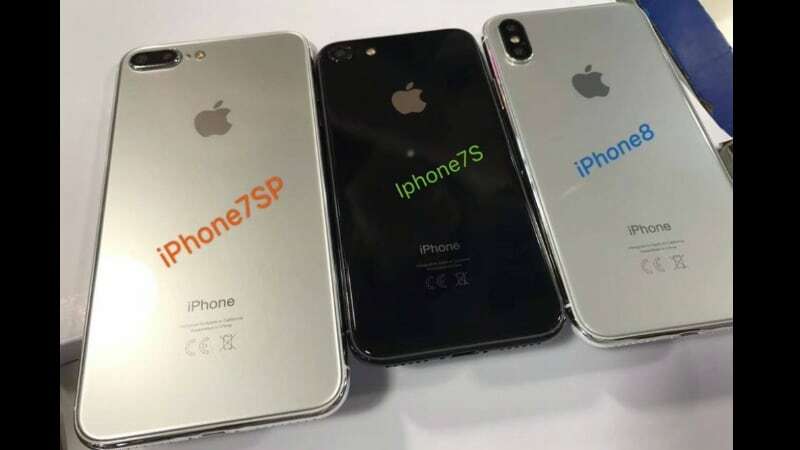 Tipster Sonny Dickson has also shared dummy unit images of the iPhone 7s, iPhone 7s Plus, and iPhone 8 sitting side by side, giving us a more comparative imagery of the three. The images were first published by 9to5Mac. Separately, DigiTimes reports that all of the three iPhones are in mass production now, and the launch is set for September. The report additionally reiterates that the supply of the iPhone 8 will be limited at first, while the iPhone 7s and iPhone 7s Plus availability will not face any issues. Finally, Gene Munster at LoupVentures reports that Apple supplier Lumentum has announced a huge increase in 3D sensing laser components orders, hinting at AR features arrival on the iPhone 8. The company has reportedly bagged $200 million (roughly Rs. 1200 crores) in orders during the quarter, a huge rise from just $5 million (roughly Rs. 310 lakhs) in revenue for the 3D sensing tech during the June quarter. Munster also predicts that the iPhone 8 will be priced at $950 (roughly Rs. 60,700), much less than what has been reported previously. While overcoming all the glitches and launching the iPhone 8 on time is a huge milestone achieved for Apple, shipping of its units will be very limited at first. The iPhone 8 is expected to be a huge update with OLED screen, wireless charging, better waterproofing, bezel-less display, AR features, and much more.